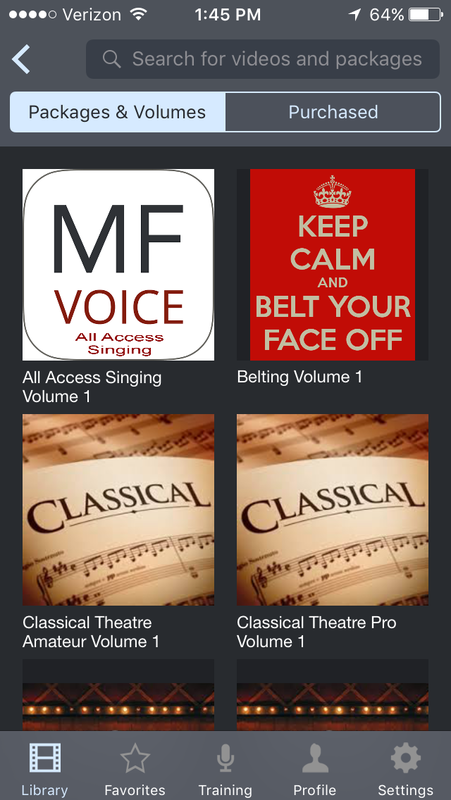 MF VOICE - Best App for Singers, rated 5 Stars on the App Store. 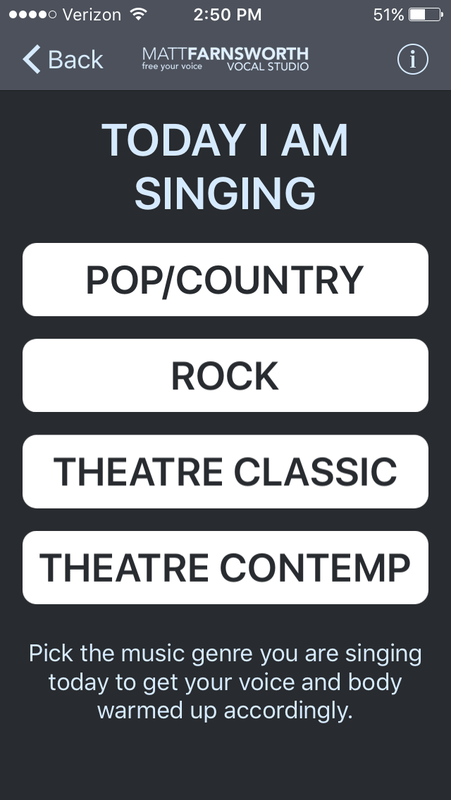 Your favorite tool for Vocal Health, Auditions, when you are on Tour and a great support for your daily Vocal Training. 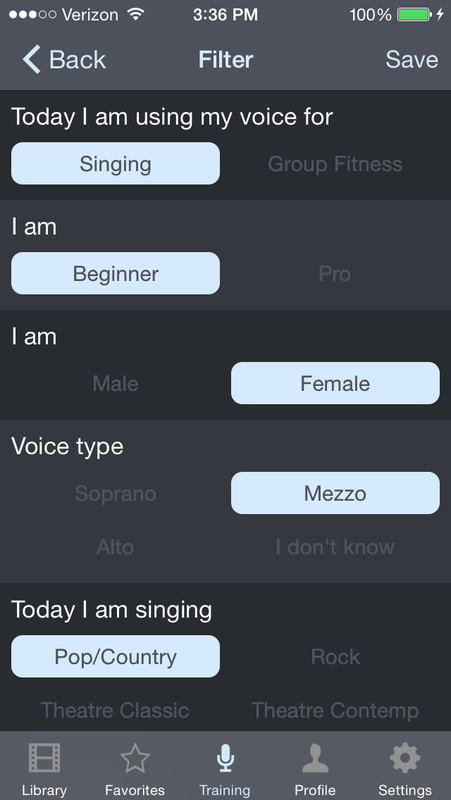 Please note this App is not intended to replace voice lessons with your teacher. 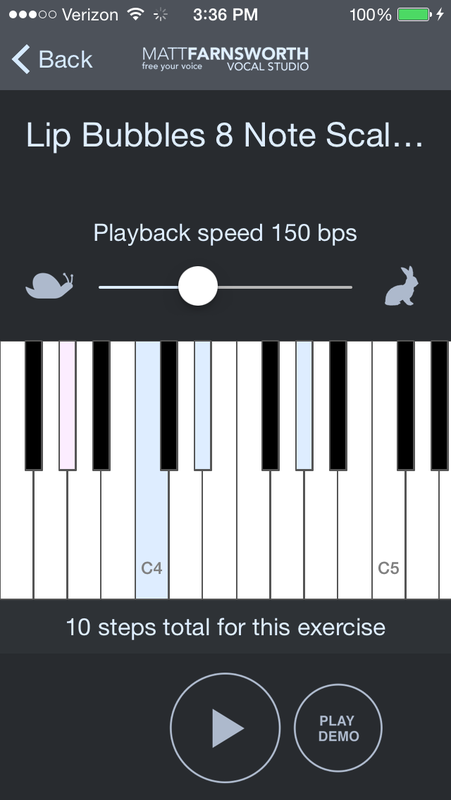 This is a vocal warm-up App and an additional resource for your training as nothing replaces an experienced set of ears to help your vocal development and growth. Like what you see? 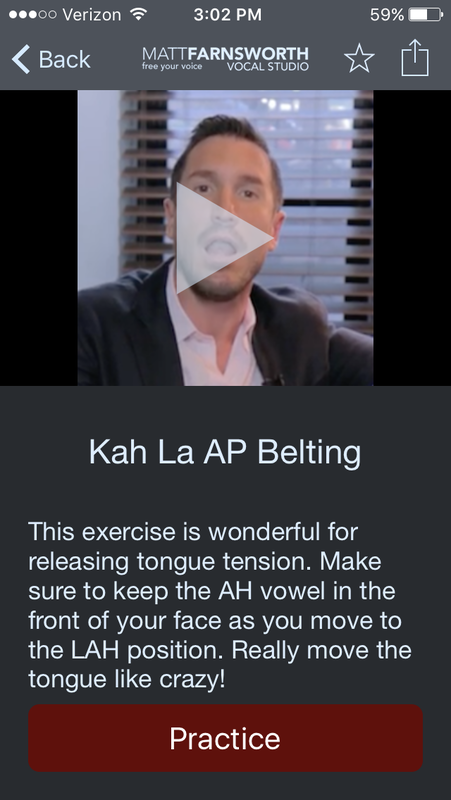 Get this video and more with our MF Voice App! Making sure your warm-up exercises are appropriate to your voice type and repertoire. Tap the info button on the top right corner to clarify your selection. 2. Want to change your selection? Easy! Tap FILTER on the upper-right hand corner of the screen on the TRAINING section and SAVE your preferences. Your new set of exercises will allow you to continue your warm-up based on what you need to sing that day. Your warm-ups will be more effective if done in the suggested order (go from left to right like when you are reading). This ensures your vocal cords will be warmed up properly and ready to sing your favorite songs. Press PLAY and watch the video demos before practicing for instructions, placement and correct technique. We explain the do’s and don’ts of each exercise to help you understand what you should be feeling while practicing. On top of this screen you can also STAR the exercise (make it a Favorite) and SHARE it with your friends via text, email and social media. The virtual keyboard is the tool to guide you up and down the scale. Make sure you finish each exercise before moving on to the next. Click PLAY DEMO if you need to clarify the sound you are going for. The speed is automatically adjusted for the exercise but you can slide the PLAYBACK SPEED if you need adjustments. Found an exercise that you really like? Tap the STAR icon on the top right corner of the screen to save it. All selected exercises will be stored under FAVORITES so you can start creating personalized go-to warm-ups. Select any PREMIUM exercise or go directly to the CART icon on the upper-right hand corner of the LIBRARY. You will be able to see all available packages and get the ones that better suit your needs. We suggest our ALL ACCESS SINGING which includes all the available VOLUME 1 singing exercises (that’s 76 videos, tips and scales). 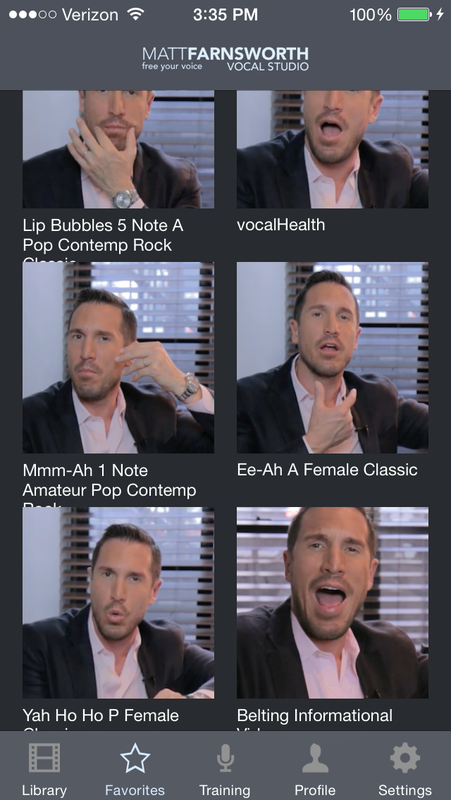 This is the best way to add variety and extensive resources to your vocal training! Tap PROFILE to learn more about Matt and our Vocal Studio. Check the TESTIMONIALS tab to see what Directors, Casting Agents and Performers have to say about our work. 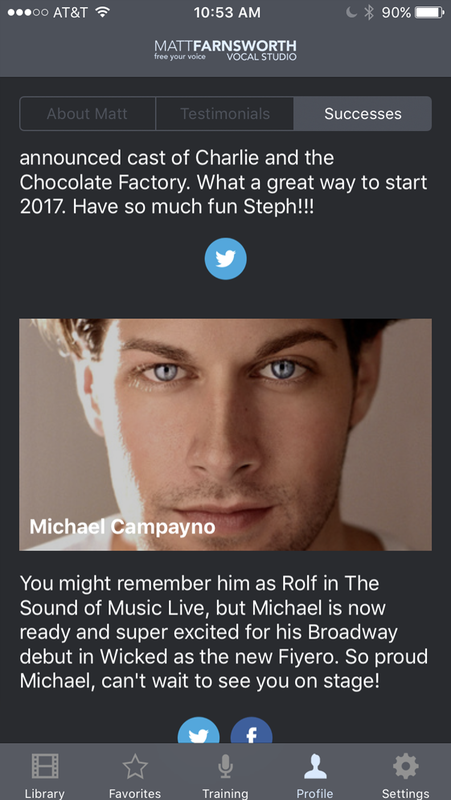 Tap SUCCESSES to read the latest show updates and discover more about our students. Navigate through the SOCIAL MEDIA links and interact with us.